Once fall starts, we see candy corn everywhere. I'm not a fan of the candy myself, but I love to create with it and love those orange, yellow and white stripes!! 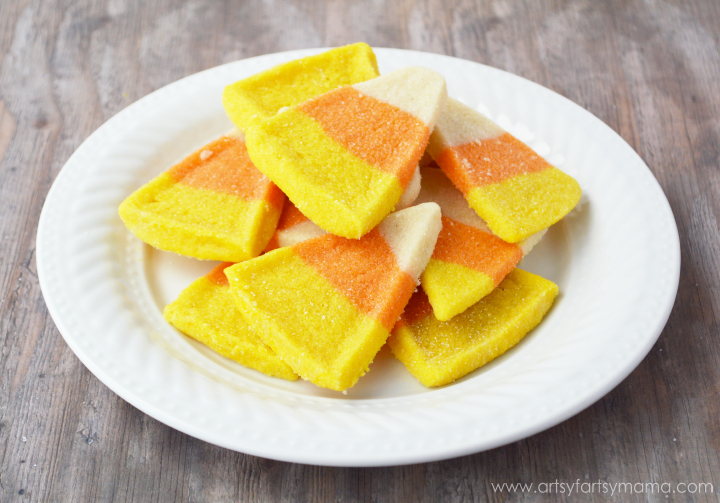 These candy corn cookies are a sweet treat to enjoy this fall and are so easy to make. Plus, there is no candy corn at all in the recipe, so that alone guarantees that they'll be delicious! Line a 9x5 inch loaf pan with parchment or wax paper. Mix up your cookie dough and divide into three equal pieces. Press one piece of cookie dough evenly into the pan with your fingers, then smooth the top with some parchment paper. Place the pan into the fridge. Use a small amount of gel food coloring and a hand mixer to color the other two dough pieces yellow and orange. Wrap the yellow dough in some plastic wrap and place in the fridge. Press the orange dough on top of the white/plain dough in the pan. *If the orange dough seems soft, you can place the pan in the fridge for 5-10 minutes. Press the yellow dough on top of the orange dough and cover the pan with plastic wrap. Refrigerate the dough 1-2 hours or overnight. Remove the dough from the pan and peel the paper off. Lay the dough on some plastic wrap or parchment paper. Cut a 1/4 - 1/2 inch slice of dough off the end of the dough brick with a butcher knife. 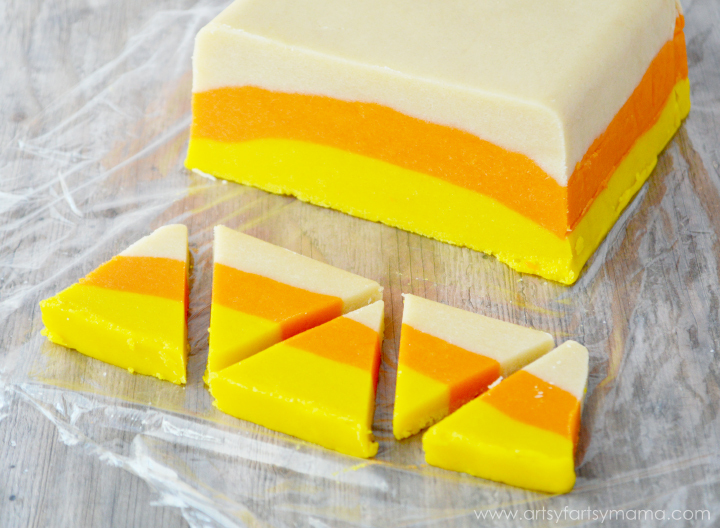 Cut four diagonal cuts on the slice of dough to make five candy corn cookies (see image above). OPTIONAL: Dip the cookies into a bowl of sugar before baking. Place cookies on an ungreased cookie sheet. (I was able to fit about 25 cookies on one cookie sheet). For best results, make sure dough is chilled before baking. Bake 350º for 7-10 minutes. DO NOT OVERBAKE. 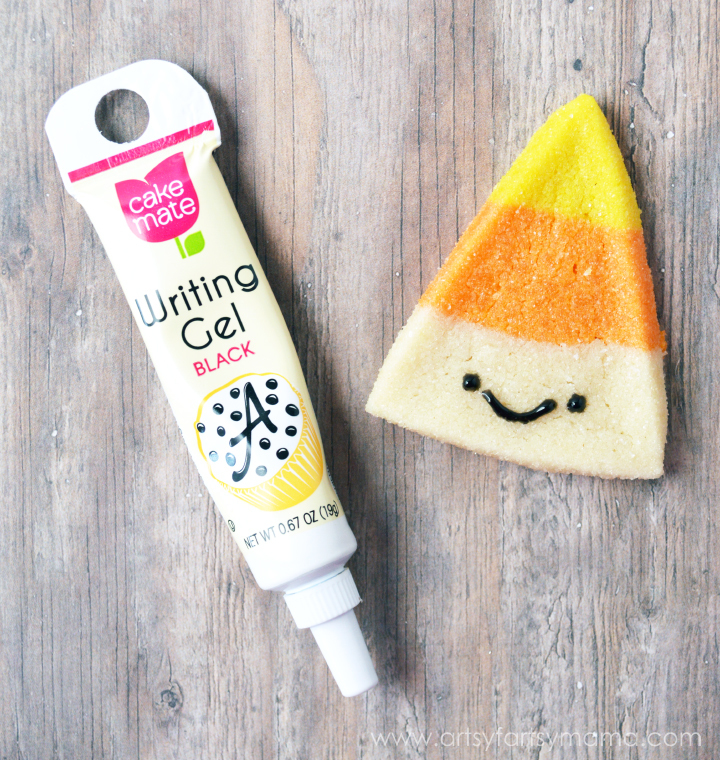 For a little extra fun, you can use some black piping gel to add some cute faces to your cookies!! My daughter loved getting to help throughout the entire process of making these cookies and especially loved putting faces on them! What do you think? Are you a candy corn fan? Oo! I hadn't seen anyone make these from scratch. 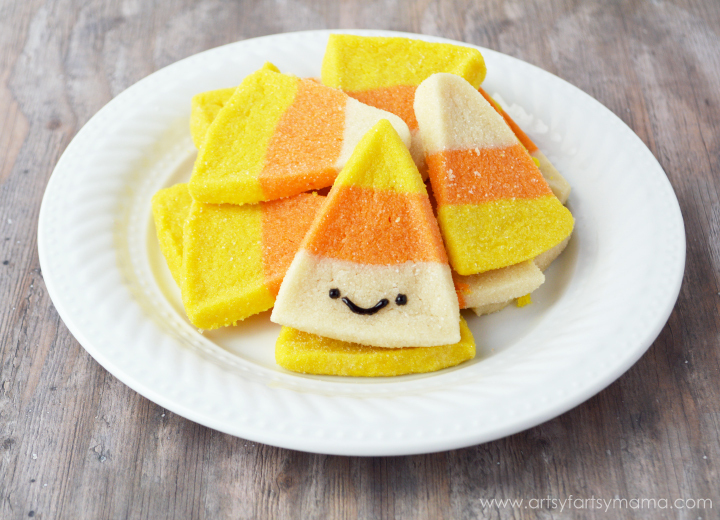 I may have missed the window to make them as candy corn (although there's always time for candy corn) but I bet I could make them with some green and red and they coudl be trees! Thanks for sharing. I am with Logan - I hate candy corn but LOVE these cookies. So cute! And seriously, who can resist a good sugar cookie. Love this recipe! These are too cute! I love the method you used to make them too - so creative!